A new study shows that anti-parallel electron spins between two electrodes create more capacitance than parallel spins, which is opposite of what is normally observed. Credit: Hideo Kaiju et. al. Capacitors, electronic components that store and quickly release a charge, play an important role in many types of electrical circuits. 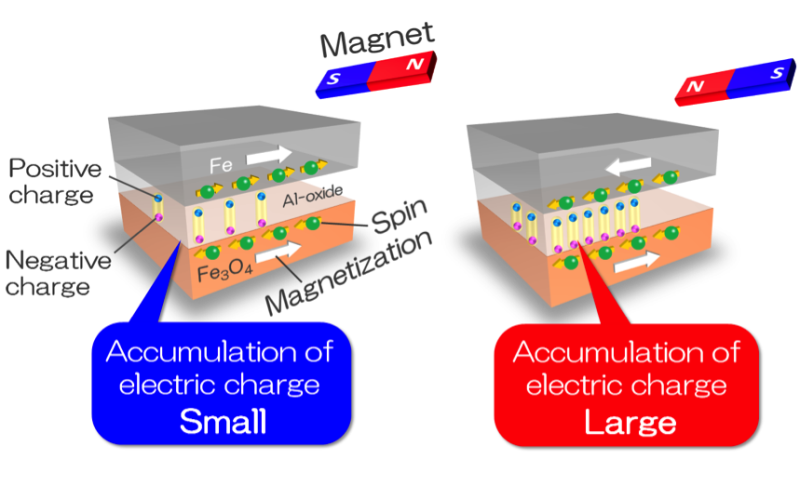 They'll play an equally important role in next-generation spintronic devices, which take advantage of not only electron charge but also spin—the tiny magnetic moment of each electron. Two years ago, an international team of researchers showed that by manipulating electron spin at a quantum magnetic tunneling junction—a nanoscale sandwich made of two metal electrodes with an insulator in the middle—they could induce a large increase in the junction's capacitance. Now, that same research team has flipped the script on the phenomenon, known as magnetocapacitance. In a paper published in the journal Scientific Reports, they show that by using different materials to build a quantum tunneling junction, they were able to alter capacitance by manipulating spins in the opposite way from "normal" magnetocapacitance. This inverse effect, the researchers say, adds one more potentially useful phenomenon to the spintronics toolkit. "It gives us more parameter space to design devices," said Gang Xiao, chair of the physics department at Brown and one of the paper's coauthors. "Sometimes normal capacitance might be better; sometimes the inverse might be better, depending on the application. This gives us a bit more flexibility." Magnetocapacitors could be especially useful, Xiao says, in making magnetic sensors for a range of different spintronic devices, including computer hard drives and next-generation random access memory chips. The research was a collaboration between Xiao's lab at Brown, the lab of Hideo Kaiju and Taro Nagahama at Japan's Hokkaido University and the lab of Osamu Kitakami at Tohoku University. The crystal structure of Fe3O4 and Fe electrodes analyzed by RHEED (reflection high energy electron diffraction). The patterns indicate that Fe3O4 has the inverse spinel structure with the same crystal orientation of the MgO substrate, while Fe takes polycrystalline structure. Credit: Kaiju et. al. Xiao has been investigating magnetic tunneling junctions for several years. The tiny junctions can work in much the same way as capacitors in standard circuits. The insulator between the two conducting electrodes slows the free flow of current across the junction, creating resistance and another phenomenon, capacitance. But what makes tunneling junctions especially interesting is that the amount of capacitance can be changed dynamically by manipulating the spins of the electrons within the two metal electrodes. The electrodes are magnetic, meaning that electrons spinning within each electrode are pointed in one particular direction. The relative spin direction between two electrodes determines how much capacitance is present at the junction. In their initial work on this phenomenon, Xiao and the research team showed just how large the change in capacitance could be. Using electrodes made of iron-cobalt-boron, they showed that by flipping spins from anti-parallel to parallel, they could increase capacitance in experiments by 150 percent. Based on those results, the team developed a theory predicting that, under ideal conditions, the change in capacitance could actually go as high as 1,000 percent. The theory also suggested that using electrodes made from different types of metals would create an inverse magnetocapacitance effect, one in which anti-parallel spins create more capacitance than parallel spins. That's exactly what they showed in this latest study. "We used iron for one electrode and iron oxide for the other," Xiao said. "The electrical properties of the two are mirror images of each other, which is why we observed this inverse magnetocapacitance effect." Xiao says the findings not only suggest a larger parameter space for the use of magnetocapacitance in spintronic devices, they also provide important verification for the theory scientists use to explain the phenomenon. "Now we see that the theories fit well with the experiment, so we can be confident in using our theoretical models to maximize these effects, either the 'normal' effect or the inverse effect that we have demonstrated here," Xiao said.